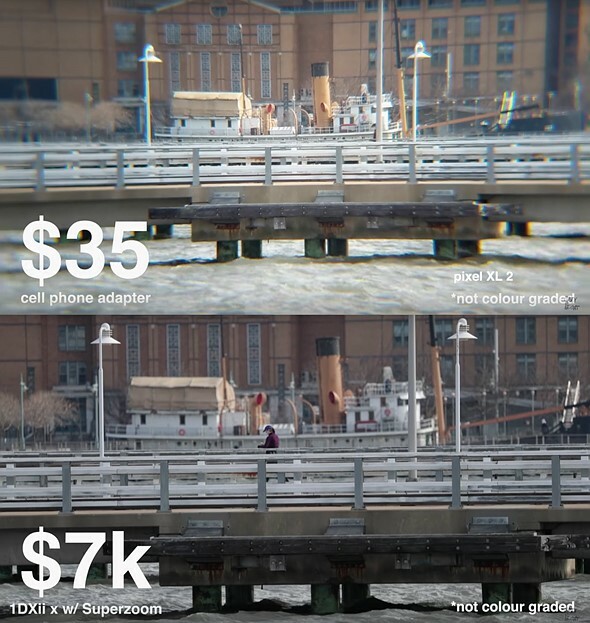 NYC-based filmmaker Casey Neistat recently compared a $35 clip-on smartphone lens with a $7,000 DSLR (the Canon EOS-1D X Mark II to be precise) and superzoom lens. The results, to no one's surprise, were not in the smartphone lens' favor. However, Neistat expresses surprise at the (admittedly very minor) capabilities of the cheap lens, saying, "So, I very gently, very reluctantly, recommend this total piece of sh*t $35 lens because it sort of almost works." However, Neistat expresses surprise at the (admittedly very minor) capabilities of the cheap lens, saying, "So, I very gently, very reluctantly, recommend this total piece of sh*t $35 lens because it sort of almost works." The proof is in the printing. The critical test of a camera or lens is not the appearance of the photos on the internet, but the quality of the prints enlarged to photo exhibit sizes, such as 11"x14" or larger. *IF* you're printing. For many folks, that's not a goal. These days, Instagram and Facebook are the targets. I'll bet you can easily find folks who haven't printed on of their photos in years. So if you're using a Nikon D850, shooting in Raw processing in LR with an Adobe filter and then uploading to Instagram with an intentionally crappy filter, you're swatting a mosquito with a bazooka! In my opinion, large prints are the ultimate test of a camera and lens, but I agree with Bob that a person's photography purchases should reflect their needs. One does not need a major brand's late$t and greate$t lens and camera just to post selfies on Face Book. A cell phone will work just fine.